Staron solid surfaces are 100% non-porous which makes them highly suitable for food preparation, and for use in hospitals and laboratories where hygiene is essential. As it is non-porous, it means that bacteria and moulds are unable to grow on it, or to penetrate the surface. Samsung Staron solid surfaces can be fabricated into any shape imaginable, so the possibilities for use in domestic or commercial properties are limitless. The product can also be joined seamlessly, so that it all appears as one continuous piece. You can have curves, angles, stunning free-flowing island worktops, and pretty much anything else that you can imagine. It is highly resistant to stains. Spills which would cause staining on many countertops – marble, granite, and quartz, for instance – such as coffee, tea, red wine, lemon juice, vinegar, and more, will simply have no effect on a Staron worktop, although it goes without saying that any spills should be wiped off as soon as they are seen. All you need is a damp cloth for cleaning. 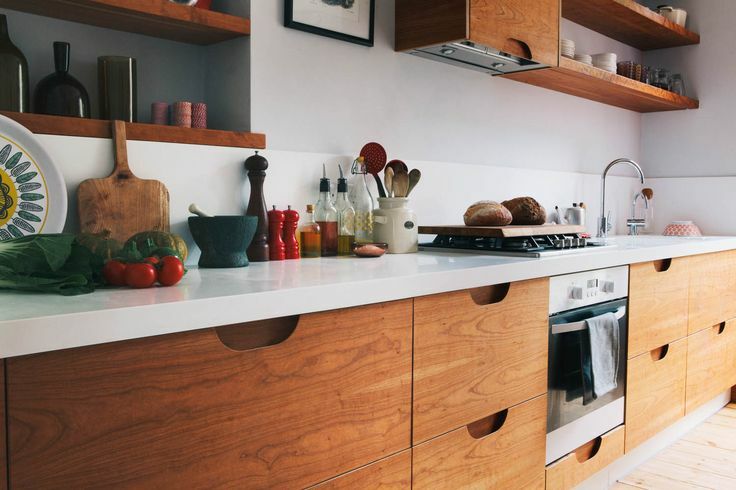 Staron worktops are also extremely heat resistant, which means that they can be fitted against a cooker, or installed as a splash back to a hob, with no problem. However, as with any work surface, hot pans from the cooker or the oven should never be placed directly on a Staron surface. Samsung say that the heat tolerance is 170°F, so you should always use either a heat pad or a trivet with rubber feet, rather than place the pan on the surface directly. 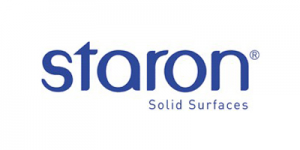 If you should cut or scratch the surface of your Staron solid surface, Samsung recommend that you call in the company who installed it for you. However, it is possible to do the work yourself by sanding it out with a sand paper. Which grade you use will depend on the finish of the surface. Staron comes in matt, semi-gloss and high gloss. If you choose Staron for your kitchen, bathroom or commercial facilities, there is also a range of Staron sinks that can be fitted seamlessly, and under mounted, so that everything flows as it should, and there are no joins that can harbour germs or bacteria. Sinks can be single or double bowl, as you wish. Staron worktops also come in a huge range of colours. These include solid colours, together with a range that is referred to as “super solid”. There are three different shades of white, reds, ambers, greys, blacks, and blues. Samsung Staron solid surfaces are the perfect choice for people who want a thing of beauty that requires virtually no maintenance and will last a lifetime. Get in touch and let us know your requirements. We would love to hear from you. Click to CONTACT US.